The Stanford women’s soccer team trailed 1-0 late in the second half against Florida State in the semi-finals of the College Cup. Chioma Ubogagu cut down the left side of the box after a great ball by Taylor Uhl to open her up. One on one with the keeper, Ubogagu froze Florida State’s goalie with just the slightest of hesitations before firing the ball across the face of the goal to the bottom right corner. For a split second it looked as though Stanford would tie the game at 1-1. Instead, a rotating defender sprinting back from the middle of the field cleared the ball from off of the line, mere inches from the front of goal. Minutes later at the tail end of the 87th minute, Florida State forward Cheyna Williams would hunt down a long-ball on the break and, with only sophomore goalkeeper Jane Campbell to beat, took the Cardinal keeper to ground and finished off the movement for her second goal, demolishing Stanford’s hopes of advancing to the final round of the College Cup in the process with the 2-0 loss. The Cardinal played the vast majority of the game on the back-foot. The Seminoles came out firing and for all intents and purposes, were playing a home-game just two and a half hours away from Tallahassee. By just the 14th minute Campbell had been called into action twice, tipping the ball over the bar on a ball that was floating towards the back to the net and senior midfielder Alex Doll had to clear a ball from the back post that beat Campbell. In the 16th minute, Florida State’s Williams opened up the scoring with an excellent shot from the top right of the box into the left side netting, giving Campbell no chance in the process. After the goal, the Seminoles seemed content to sit on their lead. The game, like the field itself, played rough and slow. Florida State played a physical game and Stanford lacked the crucial last ball to open up the defense. The pace of the game did not noticeably pick up until the last 15 to 20 minutes of the game, and when it finally did, Stanford looked like a completely different team. For a brief moment, as Ubogagu sprung free, it looked like that short window might be enough, but after the great defensive play, it would prove to be insufficient. 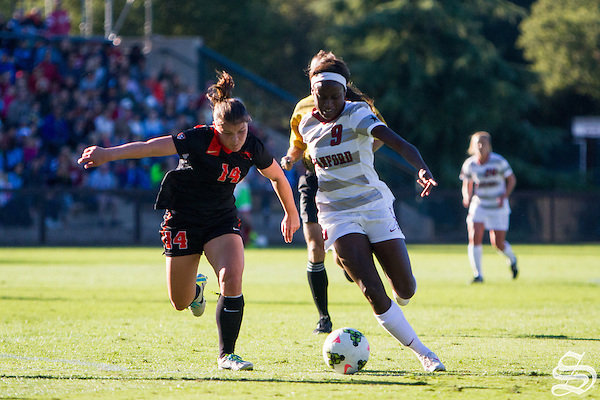 With Williams’ second goal, making it 2-0, it would mark the end of the game and of Stanford’s fantastic season. As the immortal Jimmy Greaves was famous for reminding us, “It’s a funny old game,” one in which any team on any given day may win and the best team can fall to a single mistake. It is hard to say whether or not there was a better team on Friday, but this much is clear: Stanford’s truly incredible group of seniors should return home with heads held high. Their accomplishments go far beyond the disappointment rooted in a few minutes in Florida; this was not only a spectacular soccer team, but also one that showed genuine joy in playing the game and with each other. Contact Nic Radoff at nradoff ‘at’ stanford.edu.